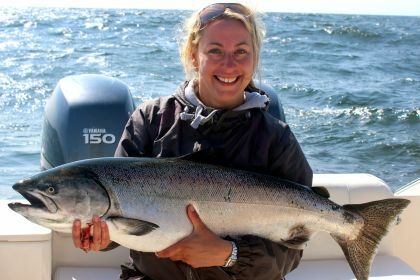 Early summer can be a rewarding time to fish and enjoy the amenities Tofino has to offer prior to the rush of July and August. With a strong run of Columbia Chinook (Kings) forecast this spring we should experience productive salmon fishing during May and June. Herring, Needlefish and squid are popular food items this time of year. We've had some productive bottom fishing trips during April and early May targeting Halibut, Lingcod and Rockfish. Typically Halibut fishing improves as the spring progresses peaking during June and early July as the fish move in from deep water to take advantage of the productive nearshore environment. British Columbia sportfishing regulations stipulate a maximum size limit of about 75 pounds (133cm max length) allowing us to target the highest quality fish while allowing the larger coarser fleshed breeder halibut to bolster the species. If you have a full day to spend a trip to the reefs west of Tofino is a great way to stock up on white meat, typically we have time to troll for salmon on the way back to town. Early season fishing variability can be offset by our proven guides who have many years experience producing fish though out the year. If your looking for adventure our freshwater wilderness fly in trip is a terrific way to get off the beaten track. Visit one of Vancouver Islands' only completely unlogged watersheds where trees with 10+ foot diameter are not uncommon. Enjoy the quiet majesty of the valley while you search for spotted Cutthroat trout in the pools and runs of this snow fed river. The Tofino Air Beaver float plane will have you back on your favorite patio for apres in the evening. 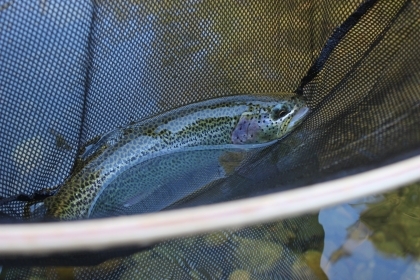 We look forward to fishing with you, please email or call us for availability and further information.